Amy Valdes Schwemm educates about mesquite gathering and cooking. The first crop of mesquite pods is ripe and many have fallen to the ground. 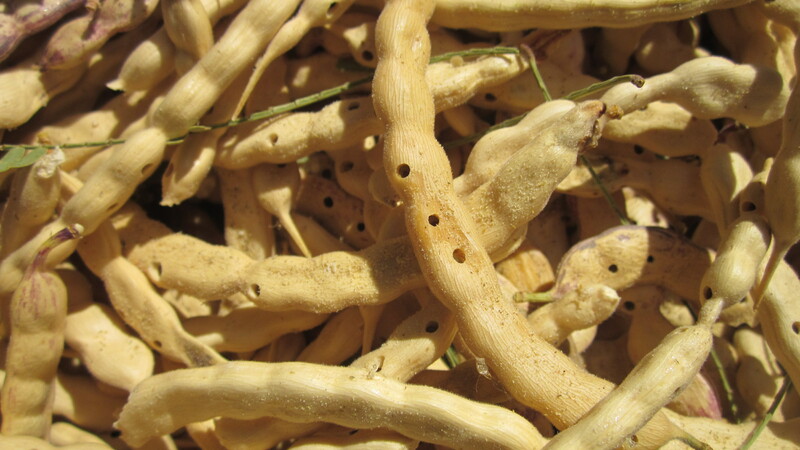 If you want to have your own stock of mesquite meal for baking, this is the time to begin gathering. I have to admit to having raked up bushels of lovely fat mesquite pods from the trees in front of my house and tossed them in the garbage. Am I nuts? No — despite their beautiful appearance, these pods taste chalky and bad. Several decades ago we planted quickly growing Chilean or South American mesquite trees. They are lushly beautiful, but if I had it to do over again, I’d plant native mesquites. 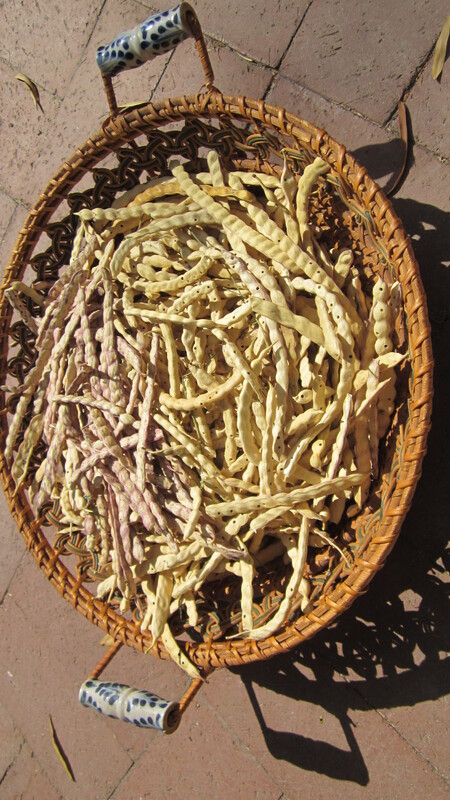 They would have grown more slowly but provided me with a great crop of delicious mesquite pods. I’ve managed to begin a collection of honey mesquite pods and will add to it as more pods become ripe. 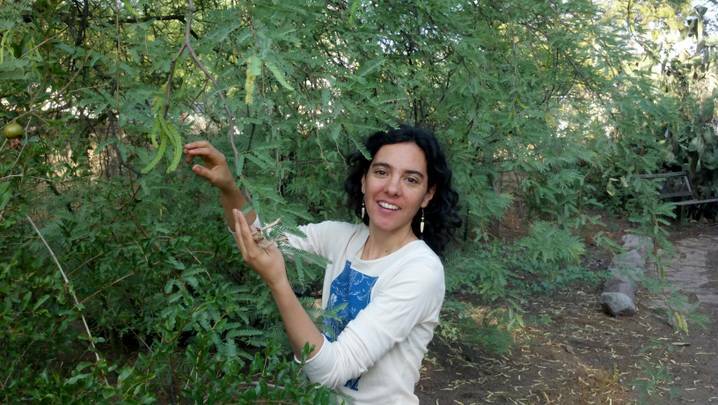 If you are unclear which pods are tasty and how and when to gather them, food expert Amy Valdes Schwemm is giving a free mesquite harvesting workshop on June 28, 2012 from 4 to 7 PM at the Santa Cruz River Farmers’ Market in Tucson. If you can’t make it, just be sure to gather from native trees. Many mesquite trees will put out a second crop of pods in the fall. Amy is one of the editors of the community-produced cookbook Eat Mesquite with lots of fabulous recipes for your delicious mesquite meal. I keep my pods in five-gallon paint buckets in my shed awaiting the Desert Harvesters grinding sessions in the fall. There are several opportunities beginning in November in Tucson. You can also find grinding sessions in Phoenix and Sierra Vista. If you and a large group of friends want to sponsor a grinding, Desert Harvesters will send a hammermill and experienced operators to you. Mesquite pods with bruchid beetle holes. Through the summer your mesquite pods will probably develop some holes where the bruchid beetles have eaten their way out. The eggs are deposited in the flowers so the beetles are a integral part of the pod, not a later infestation. If you don’t want the holes, you can freeze your pods for a while. It’s a personal decision — either you freeze the beetle inside or let it crawl out leaving behind the odd leg or antenna. Either way, just consider it more protein. The Native Americans in the area have been eating them for millenia with no problem. For more recipes for mesquite meal and other desert delicacies, check out my cookbook Cooking the Wild Southwest, Delicious Recipes for Desert Plants.